When doing paranormal research is it best to only investigate KNOWN haunted hot spots? In our opinion the answer would be NO!!!! Some folks believe that ONLY the reported hauntings of an area or building have spirit activity. To think this way would be like saying spirits get a meeting going and plan where they are going to make themselves famous for the land of the living. And only in those areas will they appear. Ghosts or spirits do not limit themselves to one area. Some spirits travel from spot to spot, some spirits are unable to travel due to the way the person or persons had died, such as an auto accident, train wreck, or murder just to mention a few. Cemeteries......Whether you know who is buried in a cemetery or not do you really think a spirit cares? Do you really think that being familiar with a spirit there is the only way to experience something? Many people have reported seeing soldiers crossing the Lundy Cemetery in Niagara Falls, yet these folks that reported seeing things in this cemetery never knew one person that was buried there. Yet this is a well known haunted hot spot. Below is an example of spirits that may not be so famous. This has been proven time and time again when you see flowers attached to a pole by loved ones where the accident had occurred. In other cases the spirit can attach themselves to the vehicle they were in at the time of their death. Does this mean the area or vehicle will now be haunted? It depends how strong the spirit is to let folks know they are in the area. When someone dies before their time they may get lost or confused, or they may not realize they have died. Or they may try to get in contact with family members to let them know they are OK.....They may have unfinished business and try to leave the area where they died and find they cannot. This may lead the spirit to make its presence known to someone in hopes of communicating with a living person to pass on a message or ask for help so they can cross over. The above is our opinion of a non famous haunting of an area or vehicle. 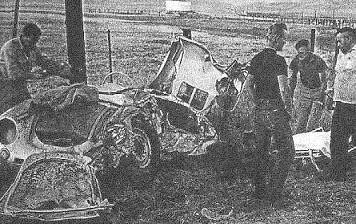 The Fatal Car Accident Of actor "James Dean"
On September 30th/1955 48 years ago the legendary James Dean met his fate on Route 41 and route 46 junction near Cohlame California, U.S.A. Many believe that the Porche 550 Spyder that James had driven possesses his spirit and anyone who takes any parts off the car will be cursed. James Dean was well known in Hollywood as an upcoming movie star in the 50's. He played a rebel role and living up to his name James always lived his life in the fast lane. In 1955 James was attracted to a silver Porche 550 Spyder .... James purchased the car and planned to race it in the upcoming races out in the Salinas. Dean was thrilled with the car but several of his friends were not. Dean's mechanic (Rolf Whether) rode in the car with Dean as they pulled out of Altantis on this fateful day. Following behind Dean's car was Bill Heckmen and Stan Roth in a Ford Station Wagon. Once Dean had gone onto the highway he let the car loose to see what it could do. Dean kept his speed up until he was pulled over by a state trooper around 3:30pm and received a ticket. Once again Dean climbed back up to speed and then they started to descend from the Diablo Range Mountains. At 5:59pm Dean met his fate when he went head on into another vehicle that was driven by Donald Turnupspeed. Dean was killed instantly. Dean's mechanic (Whether) was thrown from the car and suffered extensive injuries. The driver of the other car (Turnupspeed) suffered only minor cuts. The Porche was badly mangled. Later, after the accident Barris bought the car planning on using the Porche as a spare car for parts. When the car arrived at Barris's Garage it fell onto a mechanic during the unloading of the car breaking one of his legs. Two of the tires of Dean's Porche were purchased by a young man who later reported that both tires had blown at the same time almost causing a fatal accident. Souvenir hunters that stole parts of the car met with severe injuries. The highway patrol thought it would be a good idea to use the Porche for a safety exhibit. During one of the exhibits they had the car parked in a garage. During the night the garage went up in flames and every other car was destroyed by the blaze except Dean's Porche. Later on the car went to a Sacramento High School to be put on display on a pedestal. All went fine until the exhibit opened, then the car fell off the pedestal breaking the hip of a student. In 1959 the car was on display again. This time the car just fell into 11 pieces for no reason. In 1960 the car was crated and sent to Los Angeles. The crate with Dean's Porche never arrived to Los Angeles, it just disappeared. Our opinion on known and unknown haunted hot spots. All hauntings had to have been reported by someone at sometime. Then when another reports similar experiences at a location, they tell their story then it can gain momentum until one day it becomes a known haunted hot spot. Every reported story of a haunting had to come from someone's experience either by what they felt or got on camera or EVP recording or by Vid Cam. It didn't just happen overnight. If you happen to find a new place that is not known as a haunted hot spot for spirit activity do not be afraid to investigate the area.....You just might be surprised as to what you get on camera ETC. After you report what you had experienced maybe others will go to where you were and experience similar things you had. Over time the area you had investigated may become a well known haunted hot spot. Spirit activity can be anywhere. They do not just hang around areas that are known as haunted hot spots. There would be no haunted hot spots if no one dared to investigate an area. It takes someone to dedicate themselves and not be afraid to be the first person to discover a new location of paranormal activity to achieve these hot spots. Have you ever wondered why cemeteries only have marked graves dated back to the 1700's only? Where have all the other people that died prior to this date been buried? The stoneage, where have all these folks been buried? What about the bible days gone by? Where have they been buried? The answer....No one knows! This would by far leave many places to have activity, not just the known Haunted Hot Spots. Anywhere can have paranormal activity to it. Those that think otherwise are just fooling themselves or have been brain washed to think this way. A new building that was built on a piece of land for the first time can become haunted, or a new home, or store, etc. The land that the building was being built on could have had a war from an earlier time. Or maybe there was a family burial plot that no one knew of in the area. Or maybe someone had been murdered on the property that the new structure was built on. Many many things could have happened on the property from an earlier time that had not been recorded. To investigate the paranormal one must have an open mind and a lot of common sense and know that through time many have died in so many ways. This leaves the world of the paranormal open to those that are daring enough to discover it's secrets. All the above is our opinion only. Many may disagree but we find this hobby to be very interesting and we learn things about a place as we go. It costs us nothing but our time and no one can ever take away from us "Our Experiences." We hope that in some small way we have helped those that are interested in paranormal investigations and wish you nothing but the best.